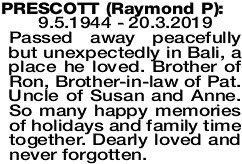 9.5.1944 - 20.3.2019 Passed away peacefully but unexpectedly in Bali, a place he loved. Brother of Ron, Brother-in-law of Pat. Uncle of Susan and Anne. So many happy memories of holidays and family time together. Dearly loved and never forgotten. 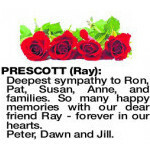 PRESCOTT RAY Deepest sympathy to Ron, Pat, Susan, Anne, and families. 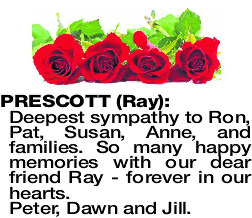 So many happy memories with our dear friend Ray - forever in our hearts. 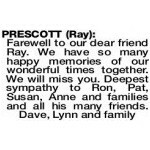 Sympathy to Ray's family on his passing. 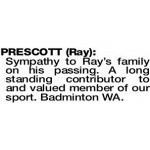 A long standing contributor to and valued member of our sport. Badminton WA. 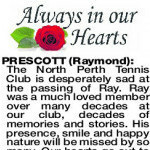 PRESCOTT RAYMOND The North Perth Tennis Club is desperately sad at the passing of Ray. 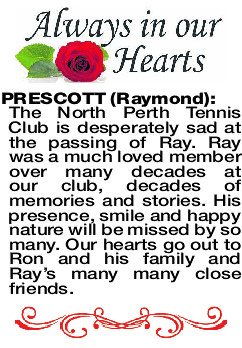 Ray was a much loved member over many decades at our club, decades of memories and stories. His presence, smile and happy nature will be missed by so many. 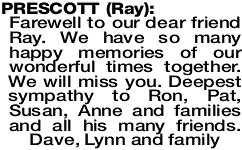 Our hearts go out to Ron and his family and Ray's many many close friends. 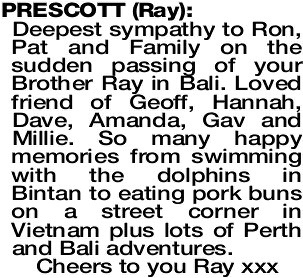 Deepest sympathy to Ron, Pat and Family on the sudden passing of your Brother Ray in Bali. Loved friend of Geoff, Hannah, Dave, Amanda, Gav and Millie. 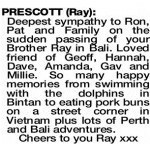 So many happy memories from swimming with the dolphins in Bintan to eating pork buns on a street corner in Vietnam plus lots of Perth and Bali adventures.